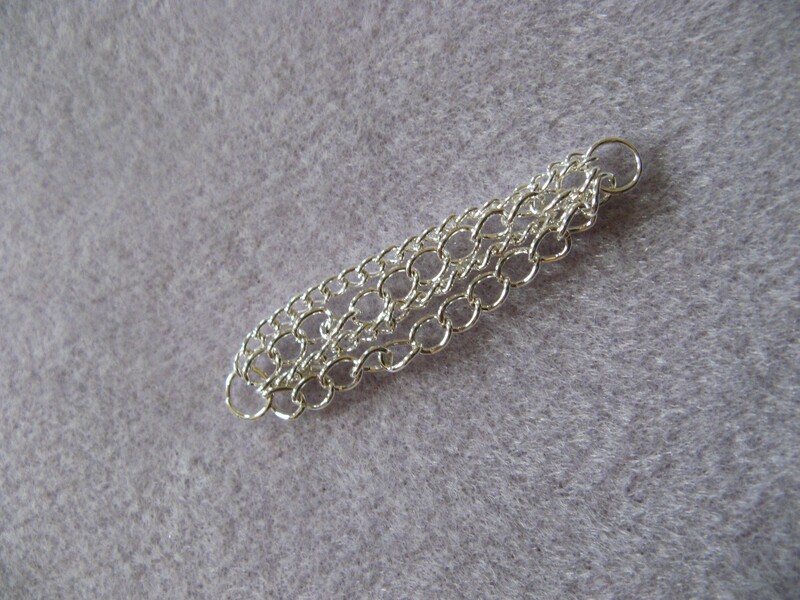 While I do have a few projects sitting on my knitting and crocheting needles, I decided to take a small break this week from working on them to make a few jewelry pieces. I made this necklace about a year ago and unfortunately the chain I used has started to tarnish. I tried to clean it but it was to no avail, the tarnish is here to stay, so, I decided to remake it. 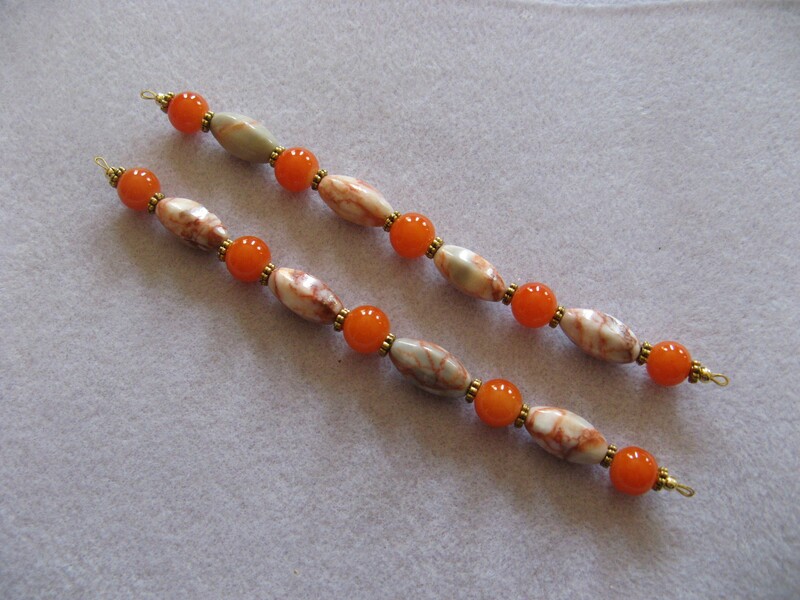 To replace the chain sections I decided to use some glass pearls and natural shell beads I had in my collection strung on flexible beading wire. I’m always happy when I can use things I already have. So many times I find myself buying more items to create things as opposed to utilizing what’s in my collection. 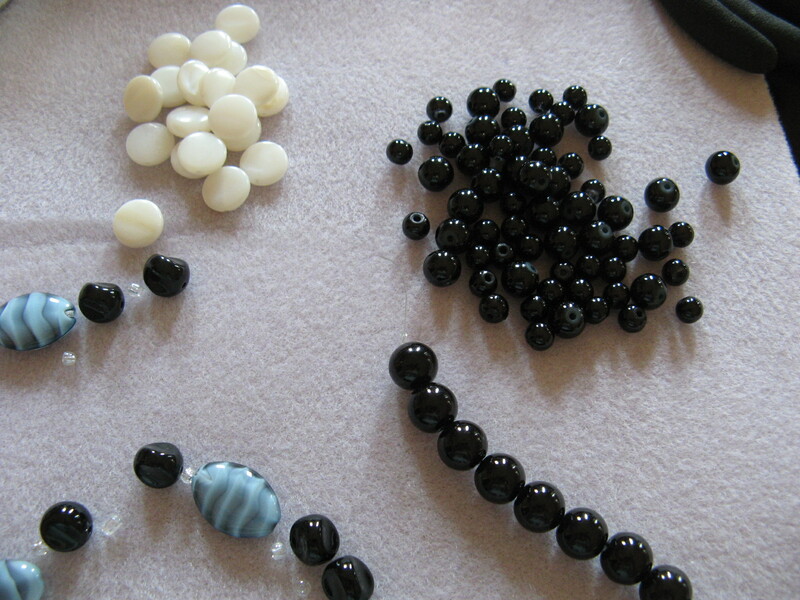 For the first section of the necklace I used three different sizes of the glass pearls arranging them from largest to smallest. 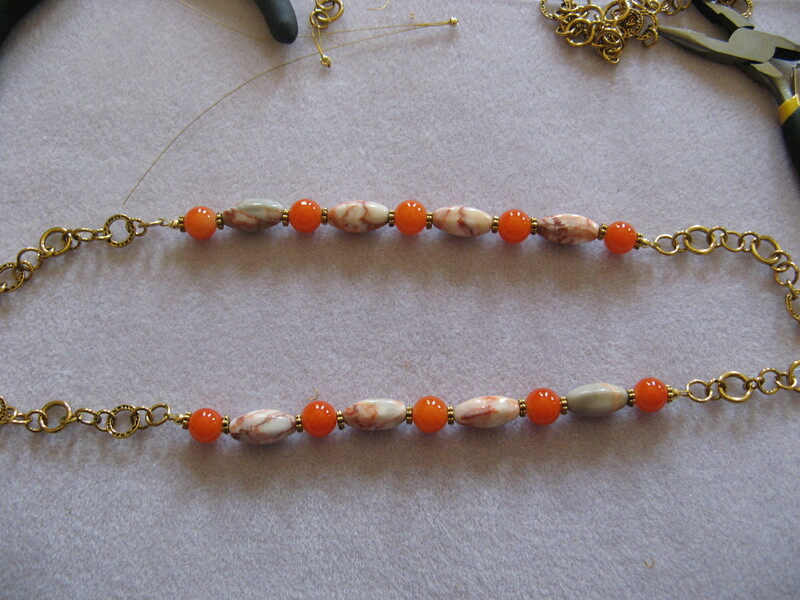 While the second section remained the same as the original necklace, I updated the third section – which used to be chain – with more glass pearls and the natural shell beads. 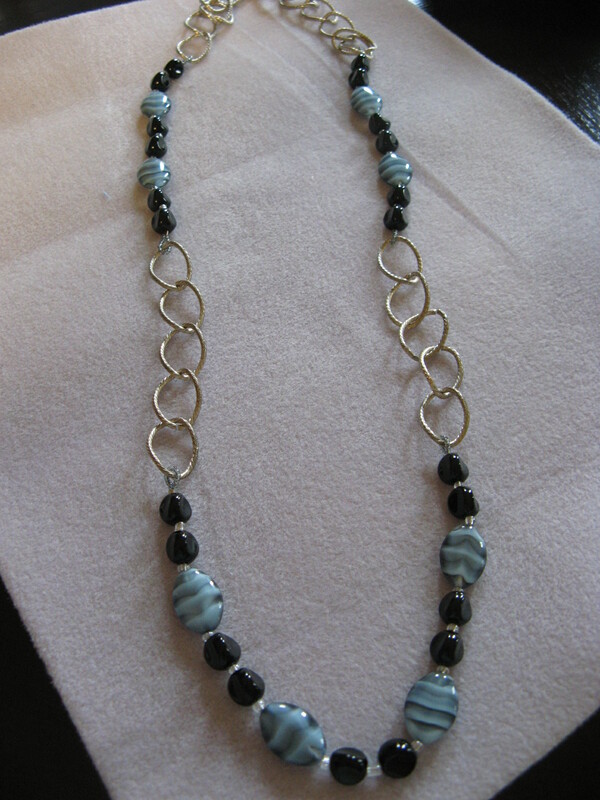 And here’s the completed necklace. At first I wasn’t sure if I liked it, but, once I tried it on I was much happier with it than I ever was with the original one. Up next I worked on a necklace that I got the idea from while I was out shopping one day. 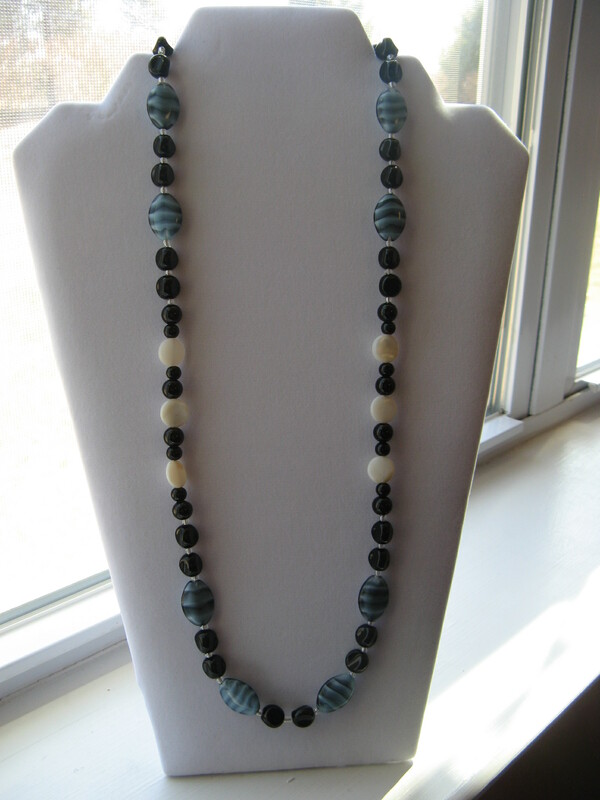 I liked the necklace I saw, but wasn’t too keen on the colors it was made with. I wanted something a little brighter and summery. 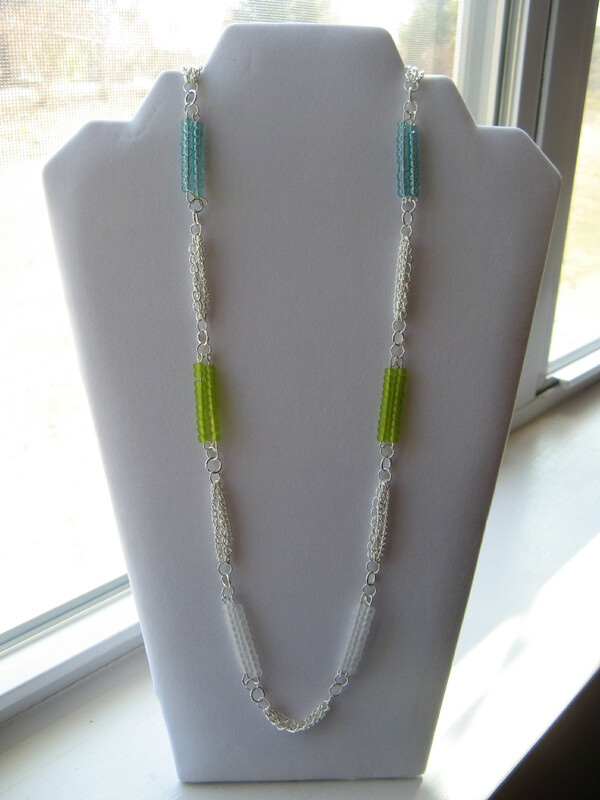 It’s made up of alternating sections of seed beads and chain. 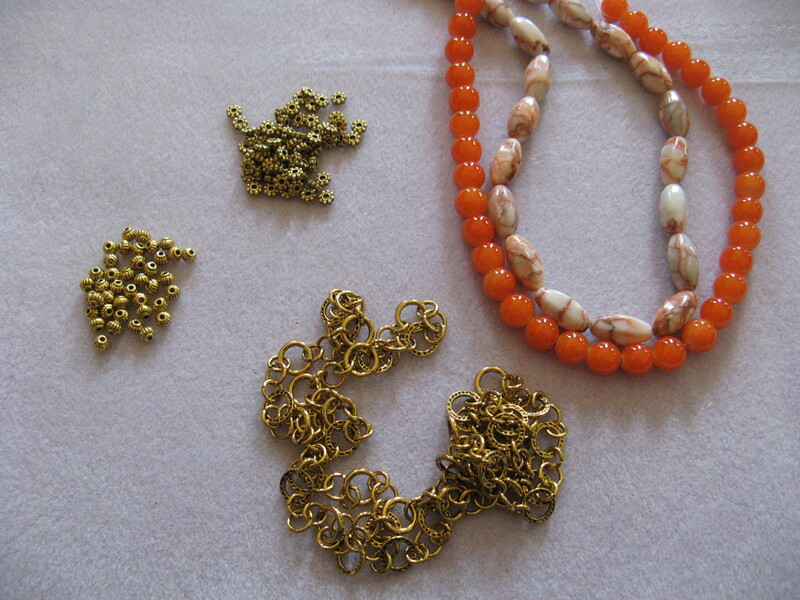 Supplies for this necklace are pretty basic; size 6 seed beads, two different styles of chains, jump rings and eye pins. 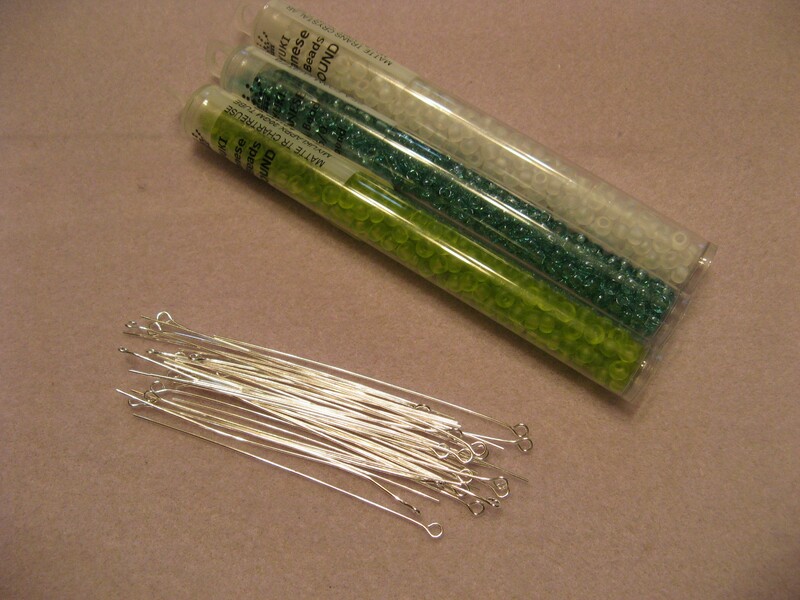 In lieu of the eye pins you could use a medium gauge beading wire. 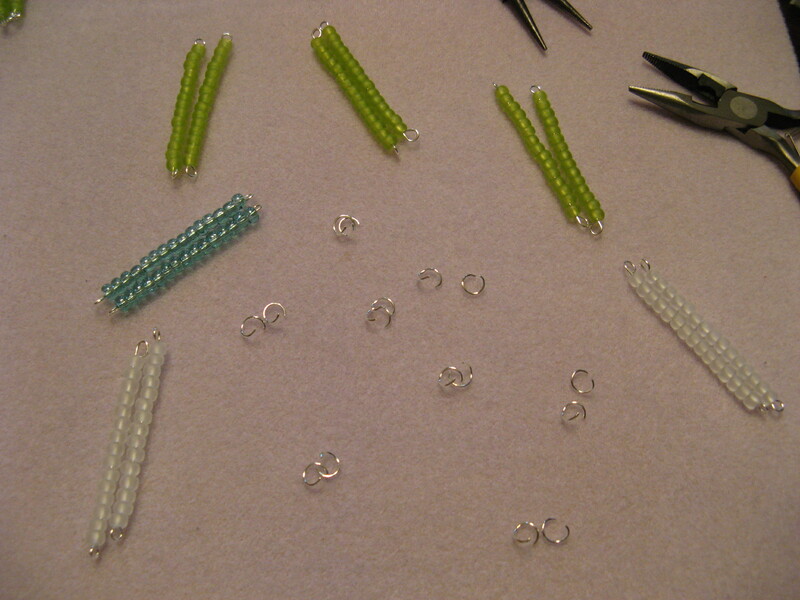 I started off by creating the sections of seed beads by threading fifteen seed beads onto each eye pin. 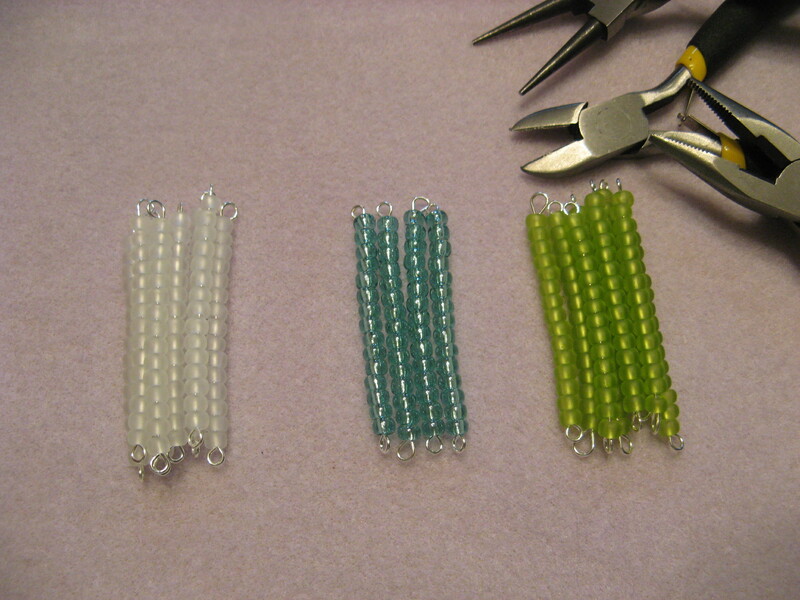 I had already mapped out the pattern I wanted to follow so I knew I needed eight stacks of the green and white beads and four of the blue beads. 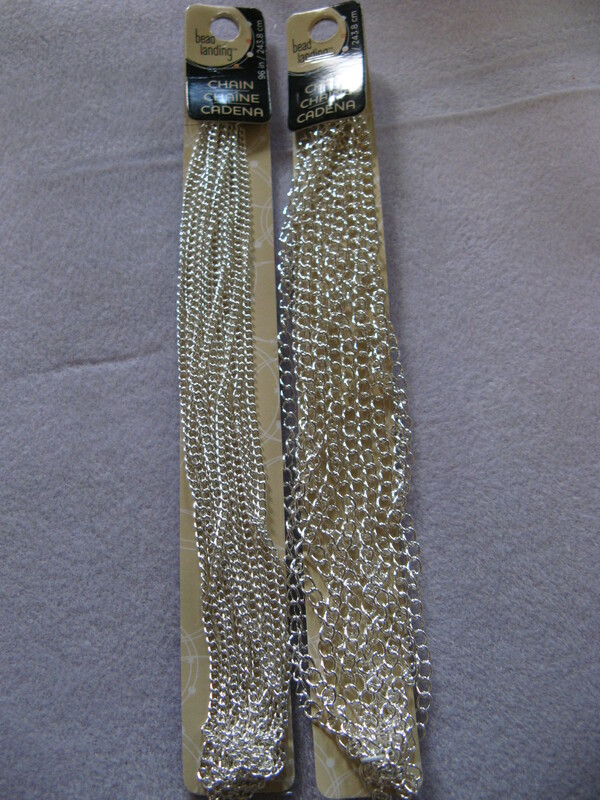 The nice thing about using the eye pins is that I only needed to create a loop on one side as opposed to two sides had I used beading wire. Following that I used jump rings to combine two stacks of each color. The stacks were about two inches long. 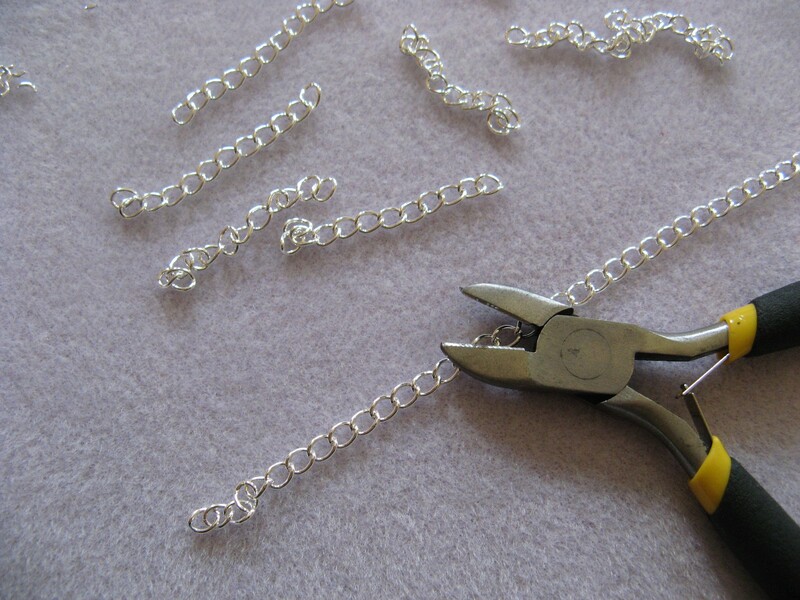 Now I was ready to cut the two chain styles into two inch sections and attach four pieces of the chain (two pieces of each chain style) to jump rings. I had a feeling that the necklace was going to be on the long side so I only connected half of it to get an idea how long it was going to be. And I was right, this one half of the necklace was approximately twenty-seven inches long so I knew I had to make some modifications. 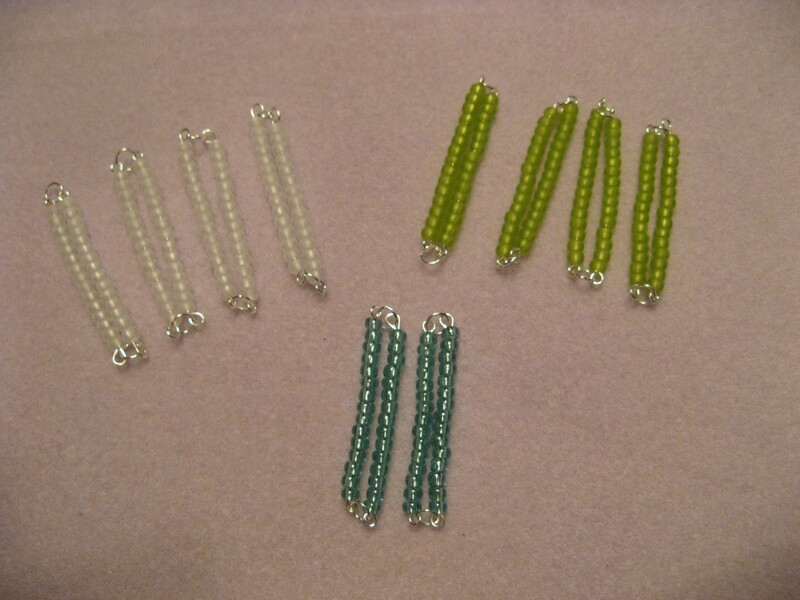 I ended up re-doing the bead stacks by eliminating five seed beads on each one and re-cutting the chain to match the new length of the bead stacks – approximately one and a half inches. 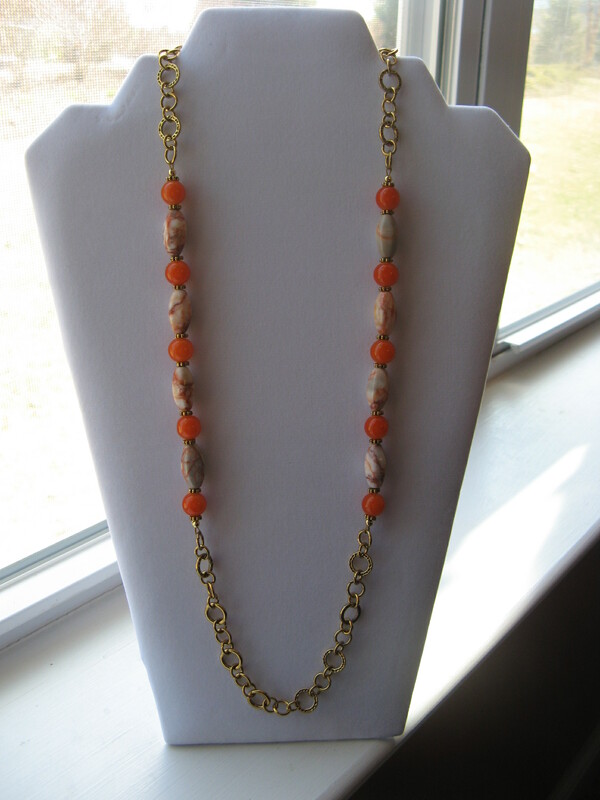 The necklace ended up being about forty inches. 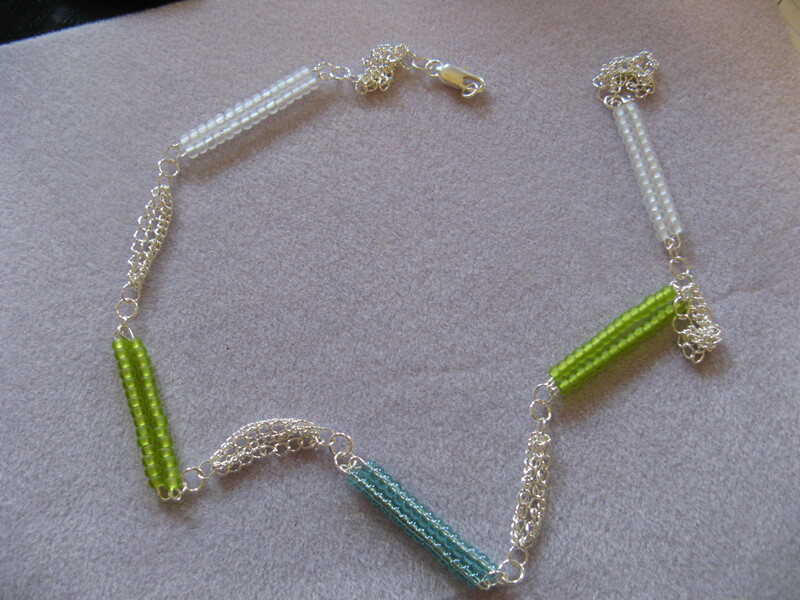 And finally I used some of the bead strands I got at the bead show I went to last month along with some chain I had to create this final piece. 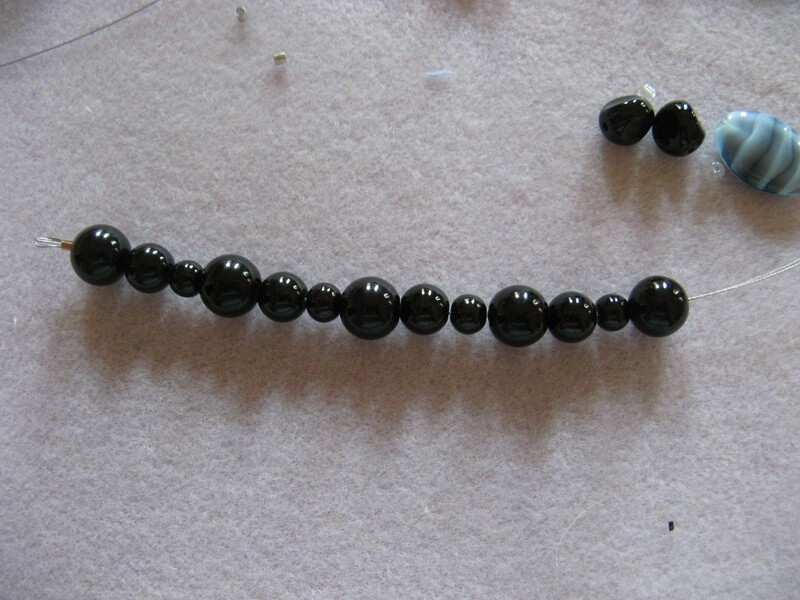 First off I created the bead portion of the necklace by stringing the beads onto flexible beading wire. I wasn’t sure if I wanted to use spacer beads or daisy spacers between the beads but once I started stringing I realized the daisy spacers were a better fit. 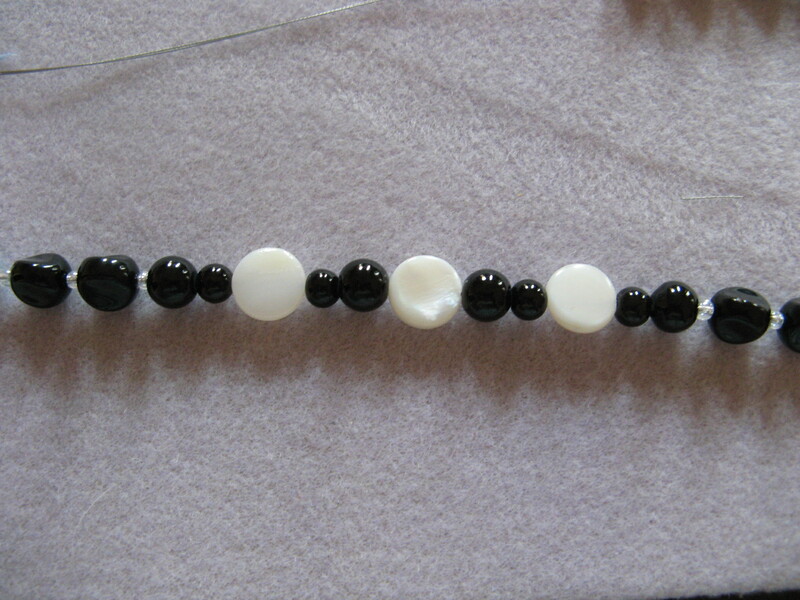 Next up I cut the chain into three equal pieces and attached them to the bead sections. And voila a new necklace. This was by far the easiest one to make and probably my favorite. Looks really nice. 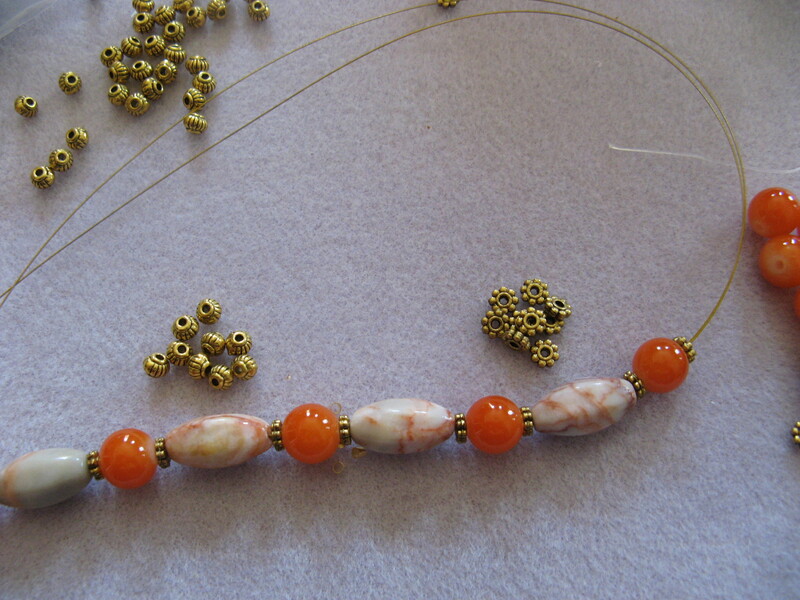 I don’t know if I can ever have the patience to make a necklace. I think it needs lots of patience. Thanks Liz! I’m sure you could do it… Most of the work is in planning what you want to make and then it comes together before you know it. Thank you for stopping by my blog. You know I always appreciate your visits. Have a great weekend!! You’re very welcome! Thanks for checking out my blog as well. Hope you had a nice weekend. You know I always come when I see your gravatar. What’s up? you are rather quiet? how have you been? Hope everything is okay for and with you? Have a great week! Hey Liz… Hope you are having a great week! How are you doing? I’m doing well… Thanks for asking. Yes, I have been quiet on the blogging front. I’ve been trying to finish up a few knitting and crocheting projects that have taken me longer than I hoped but will be back to blogging by this wknd hopefully! Look forward to seeing you back. I’ve missed your posts! Thanks for stopping by.